The tea clippers used to race to deliver new tea. Newly opened, freshly ripened matcha – tsubokiri matcha – though, is a completely different story. And even less known nowadays. Seasonality in teas is best known from the First Flush. People with a deeper interest in tea may also know about the shincha, the “new tea” harvested in May from the first fresh buds of the tea plants. Shin(cha) matcha has also become a thing. Less well known – and not perfectly explained in my video on it – is the freshly aged, ripened matcha: tsubokiri matcha. This used to be the true new tea when it comes to matcha. For the tsubokiri matcha, fresh high-grade tencha tea leaves are harvested in May, then stored to ripen in steady cool ‘climate’ for 6 months. In earlier times, this was done in cha-tsubo earthenware jars, buried underground or brought to mountain temples; nowadays, this ripening is done in climate-controlled rooms, sometimes with the tea stored in wooden boxes. The “tsubokiri” of the name refers to the opening (cutting) of the tea containers which took (and after a fashion, takes) place in a ceremony called “kuchikiri chaji”, the “tea ceremony to open the tea jar”. From the modern way of some companies, of storing this tea in wooden boxes, comes the description one finds on many websites, of the kuchikiri / tsubokiri being the opening of the wooden chests of tea. Only some companies still go with a reminder of the old tradition and place their matcha in cha-tsubo from October to November, after it has ripened the modern way. 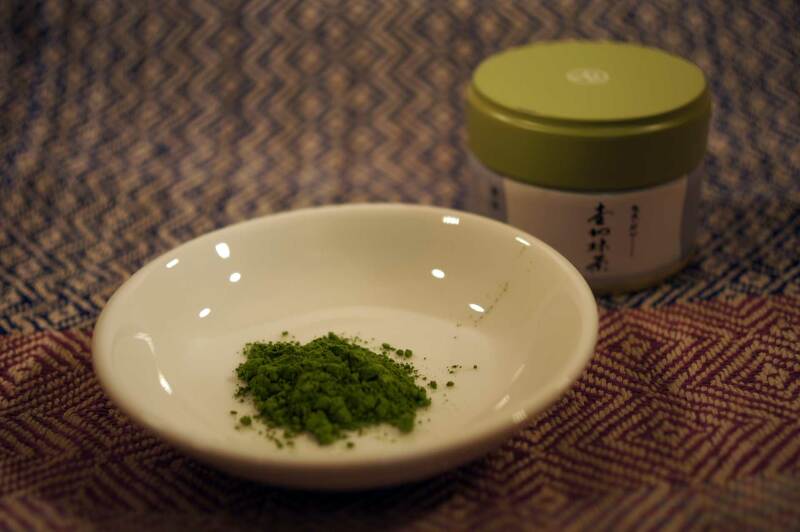 With all that background of tradition tsubokiri matcha is available from only a few companies. And given its seasonal character, it is only available around November. When I visited Marukyu Koyamaen at the end of last year, they had just started selling it, and I wanted to try it. The tencha used is already one of great quality, the ripening further mellows the flavor – it is one great tea for the connoisseur, perfectly balanced in aroma. My thanks here to Shiori from Marukyu Koyamaen for the explanation!